I hesitate to venture deeper into this planet's expansive cave systems, despite their abundance of exotic biological materials. Their extent is impossible to determine, their twists, branches and turns numerous and their exits so few that I fear I may find myself forever wandering beneath this world. Outside, the bitter cold saps my suit's power reserves in mere moments. It was a mistake to come here. One question still lurks beneath the surface, much as these many, many, many redundant iron stalagmites lurk beneath the planet's crust. If you're interested in open-world games at all, by now you've surely heard of No Man's Sky's woefully botched release version. Hell, by now the whole game industry's laughing their asses off at this butchered, tortured Quasimodo and breathing a sigh of relief at its perceived failure. I say perceived because despite its many problems, there's something quite right underpinning NMS' mountains of misconceived design choices and technical foibles and its detractors and competitors have been somewhat over-enthusiastic in trying to bury it. If you had to pick the funniest faceplant in the whole mess it's likely the revelation, immediately upon release, that NMS will not even function on Intel graphics cards, which basically means it will not work on... most laptops, as far as I know. Even my desktop's Radeon took about a month of patches to successfully load the damn thing, and given that at least now it runs smoothly, I consider myself one of the lucky ones. Oooopsie! Our customers can't use our product. While fairly scandalous, this in itself might not have doomed the project in the long run. A casual glance at the history of computer games would show many titles which have been patched, ported, emulated and seduced into functionality after poor releases and nonetheless went on to lasting fame within their niche audience. VtM: Bloodlines jumps to mind. No, the real problem becomes apparent as soon as you try to click anything in the interface, as soon as you see the screen wobbling about, as soon as you find your quickslot inventory's made utterly impractical for lack of a joystick. This is not a computer game. It was developed with gamepads in mind. Hence, I would guess, its spitting in the face of so many of its customers and their graphics cards. Hence too most of its design flaws, as it addresses a gamepad audience, a button-mashing audience. I'll go out on a limb here and say it likely means to remind players of the old classic Staflight, though knowing that one only by reputation this is mere guesswork on my part. Regardless of its specific source of inspiration, NMS undoubtedly falls into the greater category of sandboxy, open-ended, freeform open-world games, and in ignoring this simple fact its designers utterly misjudged their target audience. Sandbox exploration games are a narrow niche. NMS instead tries to sell itself to the mindless mass market, to twitchy little snots on their Playstations. I return to my original question: where's my damn compass? In Miasmata, my industrial-age natural philosopher carried around a paper map and revealed portion after portion of it by triangulating his position based on surrounding landmarks. He traveled while occasionally glancing at his wristwatch and an utterly mundane plain old magnetic compass with a red and white needle and a big ole' "N" for North. In NMS, my galaxy-trotting spacefarer's Jetsons-quality spacesuit, while able to manufacture goods, protect me from acid rain and teleport stuff to my ship's cargo hold, somehow lacks any piece of equipment that can detect magnetic North. Despite every planet you visit having a day-night cycle, you are not permitted access to even the simplest time of day estimate. In Sir, You Are Being Hunted, you could acquire a blank map on which to place a few waypoints for yourself. NMS lacks even this minimal functionality despite its much, much larger environments. STALKER made you chase around for rare resources with a limited inventory but also allowed you to create temporary stashes for yourself, to plan your movements ahead of time. It allowed you to detect enemies before they reach you with visual, audio and radar cues. NMS dumps enemies on top of you, both on planets and in space, and makes you shoot at them. Planning a trading run in Mount&Blade involved knowledge of the goods likely to be found in each city and their relative prices, cost/reward estimates of detouring to visit outlying villages, the army's food consumption and viability of side objectives like quests. In NMS, trading is as pointless as filling up your inventory and dumping everything off at the only station in your current system. These are all examples of games with more or less sandbox and/or exploration themes, and their developers understood that the basic point is to provide the player with the tools to plan ahead and consciously choose a course of action. 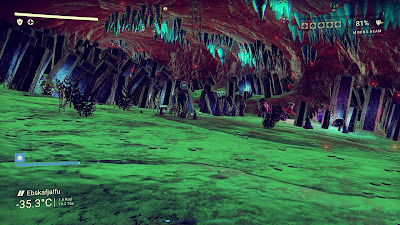 In contrast, everything about No Man's Sky's interface and interactions makes you feel as though the game's trying to play itself and staring at you accusingly for interfering with its masturbation. Your weapon holsters itself without your approval. Your HUD hides or re-appears by itself as the mood strikes it, with no options for what you want displayed. Initiating any dialogue makes you sit through several seconds' worth of un-skippable, unavoidable cutscenes of your interlocutor's face and welcome text gradually floating up. 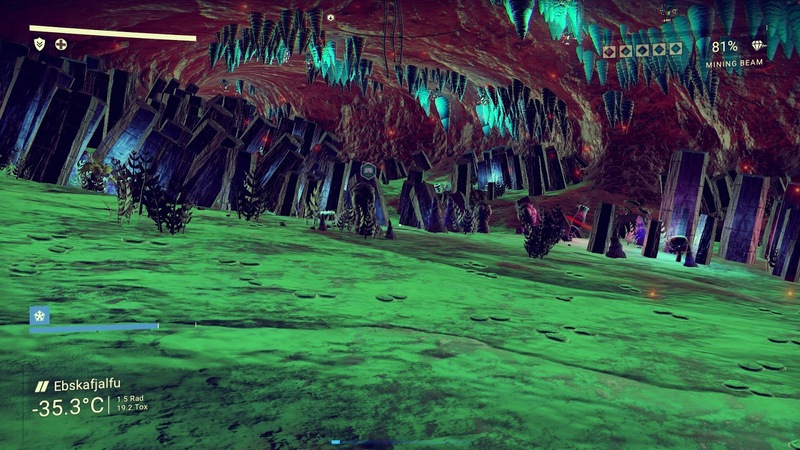 You land at random spots on random planets and mine whatever shows up on your close-range scanner and isn't carbon or iron. Your only real waypoint points you back toward your ship. Enemies teleport in of their own accord. You shoot them. Lather, rinse, repeat. Everything about NMS seems to have been designed for the worthless degenerate rabble who get scared by information. You're not permitted numeric values for your weapons or armor. You're never supposed to think in terms of maps and routes. You're never allowed to look too far, to plan ahead. You're expected to mine whatever's in front of you, kill whatever's in front of you, talk to whatever alien's in front of you. Endless "achievement" unlocks constantly block out your screen with undeserved and unwelcome praise and adulation for something as simple as walking. You're expected to be a braindead teenage stoner, a Station Player and not a desktop gamer. And yet... still. Underneath the awkwardly, insultingly, cripplingly simplistic user interactions lurks an actual sandbox greater than anything I've seen for the PC before. I was not joking when I said I could get lost in those cave systems at the start. In fact, I did, twice, wandering beneath randomized caverns looking for a way out until my suit's life support ran out. The crafting system's nothing to write home about but it's set up to handle multiple resource / product tiers so there's plenty of room to expand upon it in the future. The planets are huge, and the planets are endless. The algorithms which generate them are solid. I have never found any place altogether useless or inaccessible, and at least in survival mode moving from cover to cover to avoid environmental hazards makes things interesting enough. Minerals are in fact destructible terrain you vaporize with your mining laser, sculpting them out of the surrounding dirt. Albeit largely cosmetic, NMS even includes a language system having you discover words of alien languages before you can understand NPCs' flavor text and unlock certain rewards. Wait, the warrior's "nostrils" - what nostrils? There's a lot to work with, here, if development were to continue. A better inventory and market system (see EVE-Online) combat more strategic than an idiotic arcade shooter, some rudiments of logistical planning built into the interface so more intelligent players can plot their own courses and save waypoints and notes. Actual maps made to be read and interpreted by the players and not merely point the way to the galactic center. Stop telling players where to go and start giving them the information to decide for themselves. Cut the interfering scrolling and automation from the interface and give us some customization options instead. I shouldn't get killed while your idiotic letterboxing pop-up achievement unlocks block my vision and prevent me from interacting. The overarching long-term gameplay desperately needs larger attainable goals beyond "accumulate cash" or "go over there" but the first major patch after release has already introduced a base-building system. As I recently rhapsodized, a home, sweet home can do wonders in terms of centering the player experience. Most of all, NMS badly needs to get away from the mindset of forcing the player to merely react brainlessly to pop-up adventure-bites. The randomization and freedom of sandbox games should fuel purposeful, intelligent action, not merely prompt re-action. The potential is there. I'm less discouraged by a bare-bones release than most perhaps because I was one of the earliest to buy into Mount&Blade when they were accepting ten-dollar early beta preorders. It consisted of one town containing one arena and one tavern, but its skill, combat, supply management and overland/combat map integration were all solid. From there it eventually ballooned into six kingdoms, towns with dozens of trade specialties, army formations and reciting medieval poetry to your betrothed. No Man's Sky lacks a much-needed over-arching framework, but its exploration, resource and empire-building basics are solid. It could still become something great, if given the chance. Ideally, with a Spore-style automated creature/ship/building sharing feature it would easily gain the content to take the edge off the repetitiveness most complain about now. I am however more discouraged by the game industry's renewed obsession with pushing game consoles and catering to console cretins. There is no reason to market grandeur to the small-minded, to button-mashing twitch gamers too scared of keyboards to ever play anything strategic. Stop trying to market massive scale and freedom of action to the mentally deficient incapable of formulating any course of action beyond hitting the next thing in front of them.